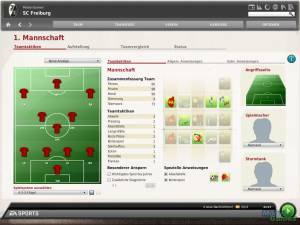 Handball Manager 2008: Das Original is a managerial simulation of handball where the player is responsible for the financial and athletic success of his team. Regarding gameplay and options it is similar to soccer managers. The player has several options to his disposal, e.g. training, tactics, lineup, stadium expansion or player transfers. The players are represented with a ability score and several other personal traits which influence their performance and training needs. An assistant coach can take some responsibilities of his shoulder - but of course he wants a proper salary if he is competent. As in most German sport managers the player has a lot of opportunities which influence not his team but his player character personally. He can change his team, buy status symbols or even found his own club. The game evaluates his successes and increased or decreases his level. If it increases he gets manager points which he can reinvest in better abilities, e.g. training. At the start of the game he chooses between a real career starting with a low-class team or picks a specific team. In comparison to Handball Manager 2007: World Edition a few options, especially the tactical ones, got expanded. The main innovation however is a second match presentation mode where the player can watch the game in 3D. Of course the player can also choose the old text mode. where he sits in front of a live ticker where all matches are calculated. If something interesting happens during the own match text messages tell him about the moves and results. The player can set how detailed and fast he wants the messages to be.